作者: Bishnu Gautam on 26 November , 2013. Unified Communist Party of Nepal Maoist (UCPN-M) that waged an armed insurgency from 1996 to 2006 in Nepal killing about 17,000 people had suffered a humiliating defeat in the second election to the Constituent Assembly (CA) held on 19 November. However, the communist party which had claimed to win the election with two-thirds majority during the election campaign is adamant to accept the people’s verdict. It blamed rigging for their defeat and walked away from the counting places when the initial signs showed its defeat, including its top leaders, in the midnight on November 20. “The election was rigged and we will boycott the counting and not participate in CA unless the election process was halted and reviewed,” its powerful chairman Pushpa Kamal Dahal ‘Prachanda’ said in a press meet early in the morning on 21 November. He also termed the election as held under a ‘grand design’ of local and international powers. Earlier, Prachanda had lauded the government and the Election Commission immediately after the polling ended on 19 November for holding the election in a free and fair manner. The childish act of Prachanda came as a shock to many. However, the Election Commission outright rejected the demand and continued the counting process. ‘Prachanda’ himself lost the election to Nepali Congress candidate Rajan KC with a big margin in Kathmandu constituency-10 from where he was elected in the first CA by defeating KC. This time the communist leader was placed in the third position in Kathmandu but got elected from Siraha in eastern Nepal with a margin of less than 1000 votes. When all the results of the 240 First-Past-The-Post (FPTP) seats was made public on November 25, the UCPN-Maoist won only 26 seats while Nepali Congress (the oldest democratic party of Nepal) won 105 seats and another liberal communist party–Unified Communist Party of Nepal-Marxist/Leninist (CPN-UML) won 91 seats. In 2008 polls, the UCPN-M had won 120 seats under FPTP and 237 in total in the 601-mmeber CA. When the 50 per cent counting of the proportional representative (PR) votes for 335 seats concluded Monday evening, the UCPN-Maoist was placed in the third position by receiving only 16 per cent votes While NC garnered 27 per cent and CPN-UML 26 per cent. Political parties of Nepal which failed to promulgate the new constitution from the first CA elected initially for two years in 2008 even after extending its term for four years due to division among the parties over the issue of federalism and governance system had agreed to hold the CA election for the second time by forming an interim government led by Chief Justice Khil Raj Regmi. 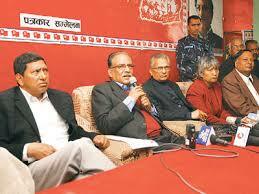 Interestingly, the first CA was dissolved by the UCPN-Maoist-led government in May 2011. It was Prachanda himself who had proposed the formation of the government under the chief justice. About 75 per cent voters cast their votes amidst the strike and explosions by the breakaway faction of the Maoist which boycotted the polls. But the same leader threatened to not accept the poll results only because it failed to win it. The apolitical act of UCPN-M drew flak from the people and journalists. The social sites are full of comments making mockery of Prachanda and other Maoist leaders. However, due to the growing pressure from leaders of other parties and representatives of diplomatic missions, the UCPN-Maoist is likely to participate in the CA. On Monday evening, the party instructed its candidates who won the elections to organize victory rallies.